My neighborhood is sometimes a tricky thing for people, including me, to wrap our heads around. It's sort of big, but not like Moon-big. It's big only because it can change and have crazy places pop up and then get de-imagined or folded into an idea for another place. At first glance, a stodger, or a commercial goon, might call it magical - but it's not like that. It's like, whatever we put into it, makes it, and if we all like something, then that place becomes important in the neighborhood. Like a successful pizzeria, or a popular Igloo run by penguins that sells shaved ice with fruit juice on it. Some places in my neighborhood are real, or based on real places that I've visited or heard about. Some places are from the past and don't exist anymore in the real world, but they do exist in my neighborhood. Some places are just made by me and my crew out of things like video footage or styrofoam or fun-tak or baseball cards. Whatever makes it to this SHLOG is part of my neighborhood. And as long as you're visiting, it's your neighborhood too. 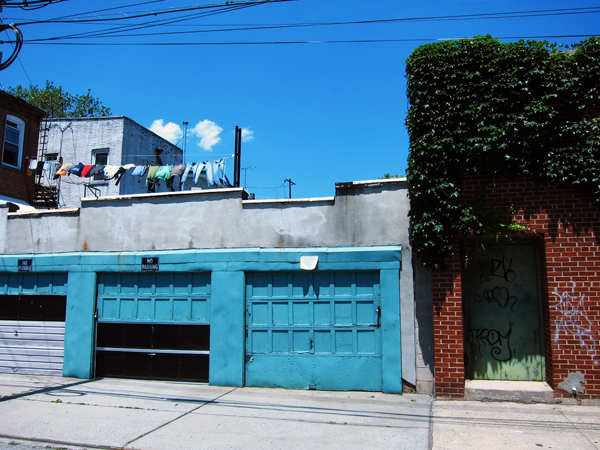 The only real rule is that these blue garages mark the Northern Boundaries of my neighborhood. There are Southern Boundaries and Eastern Boundaries and of course Western Boundaries, but today I'm just showing you the Northern ones. The things beyond these garages are in another neighborhood, one that is being imagined by someone else. It's not bad there, it's just different, and that's good. I've visited this neighborhood many times, especially to enjoy how the sky looks there. From here, on my side, it looks blue. On the other side, it looks purple with wavy tin-foil like streaks. I've never met the person that imagines the neighborhood on the other side of the blue garages but all the talk is that they are very nice, but shy. Well, maybe one day we will meet them together! The Northern Boundaries of Frankie's Neighborhood. the "too-honest" zone, and most of New Jersey.